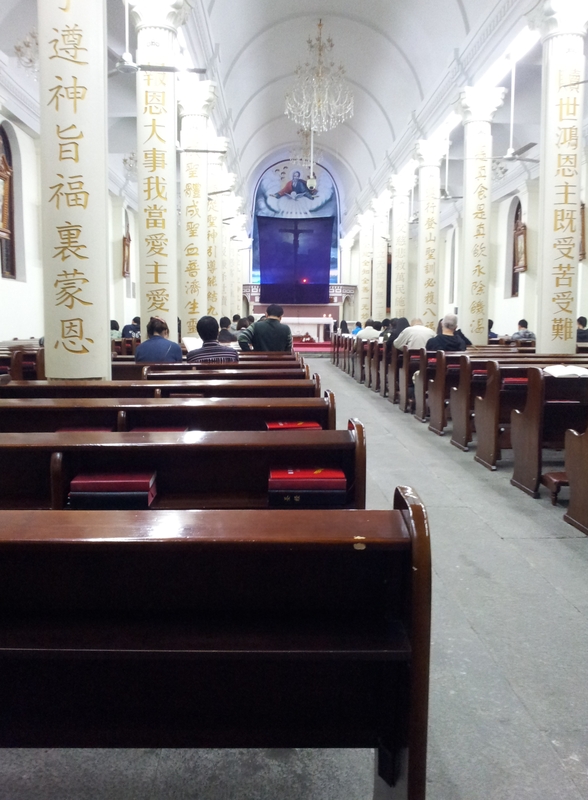 considered one of the most serenely beautiful churches in China. Remarkable is the wonderful quality of silence experienced within, given that bustling Zhongshan Road is only a very short distance away. 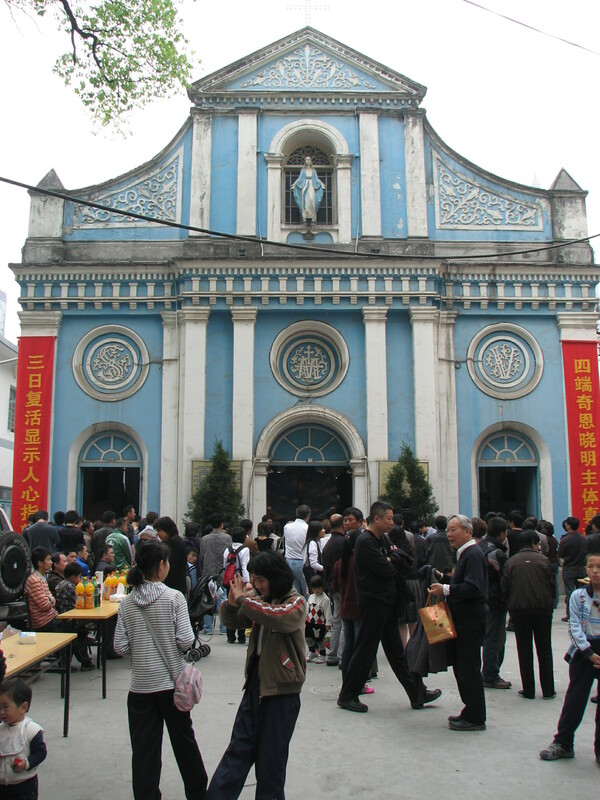 Known simply as Tiānzhǔ Táng (天主堂), the three naves Catholic Church sporting a conspicuous baroque facade is the only Catholic Church currently in service within the city of Hangzhou. Indoors, the three naves (or one nave and two aisles) are separated by two rows of columns running longitudinally down the granite tiled flooring to the sanctuary of the main altar and apse area which is adorned by a large, eye-catching, fresco depicting Christ watching over his Hangzhou flock by way of bright rays of light beaming through clouds of darkness over the West Lake. Striking in its simplicity the fresco based on typical western artistic styles was painted by local Hangzhou artists. Natural light, beaming through stain-glass windows of saints, brightens the inside and the aisles on either side of main aisle lead down to side-altars worshiping statues of St. Peter and St. Paul. Placed at intervals along the side walls of the outer naves are plaques depicting the Stations Of The Cross, and there is also one confessional booth. 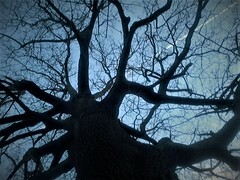 It will be difficult to find anyone locally who knows much about its history. 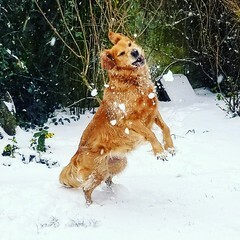 Here’s what I found out. Likely inspired by the baroque designed Chiesa del Gesu Jesuit church in Rome, which was the model for many Jesuit churches, the first Catholic Church of Our Lady Of The Immaculate Conception in Hangzhou was built in 1661 by Italian Jesuit pastor, missionary, cartographer, and historian, Martino Martini (Wei Kuang Guo / 卫匡国). 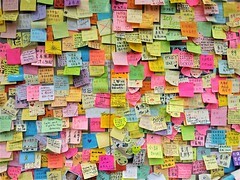 It had taken two years to construct and was hardly built when on June 6th Martino Martini died from cholera in Hangzhou. He is buried in the Dafangjing Jesuit Cemetery (大方井卫匡国等公墓) on the north side of Beigao Feng (北高峰). It seems that twenty years later Martino Martini’s body was discovered in a relatively unblemished state, whereupon it became a venerable object of cult-like worship, not only for Christians. In 1877, in a bid to put an end to what it perceived to be idolisation, the Catholic Church hierarchy had Martini’s body reburied. As the leading China geographer of the 18th Century, Martino Martini is celebrated as the first to undertake the study of Chinese history and geography with meticulous scientific impartiality. Added acclaim in China and beyond alludes to Martino Martini’s unique awareness of Chinese culture and profound understanding of all things Chinese as being the bedrock from which modern sinology has developed. During the reign of the Qing Emperor Kangxi, in 1691 an anti-catholic drive coordinated by Zhang Penghe (张鹏翮), the Confucian governor of Zhejiang Province, resulted in the practice of Catholicism being outlawed throughout Zhejiang. The Italian Jesuit Prospero Intorcetta, who had already lived in Hangzhou for 13 years, was expelled for staying in Hangzhou without authorisation, publishing books, circulating pamphlets throughout Zhejiang, and baptising over 1,000 people. Governor Zhang subsequently took over the Church of Our Lady Of The Immaculate Conception ordering all its books to be burned and printing woodcuts destroyed. The following year, under pressure from Jesuits and Manchu Prince Songgotu, Zhang Penghe in an apparent about turn commanded that the Church of Our Lady Of The Immaculate Conception be completely repaired. However, Zhang continued to arrest and persecute Catholics, while several churches in Hangzhou, Haining and Jiaxing which didn’t have residing priests were confiscated. In late 1692 the Catholic Church of Our Lady Of The Immaculate Conception in Hangzhou was badly damaged by a fire, remaining in a state of disrepair until 1699 when Emperor Kangxi himself passed by the church. After one of his ministers had inspected the interior Kangxi granted 200 silver taels to complete the restoration. Two characters “敕建” (chi jian) – meaning “built by order of the emperor” – were inscribed on to the gate. In 1730 Kangxi’s son Emperor Yongzheng proscribed Catholicism and Catholic Church of Our Lady Of The Immaculate Conception was converted into the Tao Buddhist temple of the Celestial Empress, Tian Hou Gong (天后宫). The characters “敕建” were chiseled off the gate. It was not until 1848 that it became a working Catholic church again when a group of Dutch, French and English Lazarists took it over. 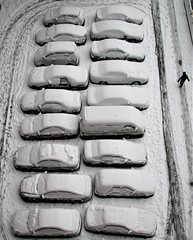 Further disruption occurred during the Cultural Revolution when all religious activities ceased. For a period of 12 years the main church hall was divided into 10 small cells for imprisoning criminals, while the other church buildings were also divided up as residences. 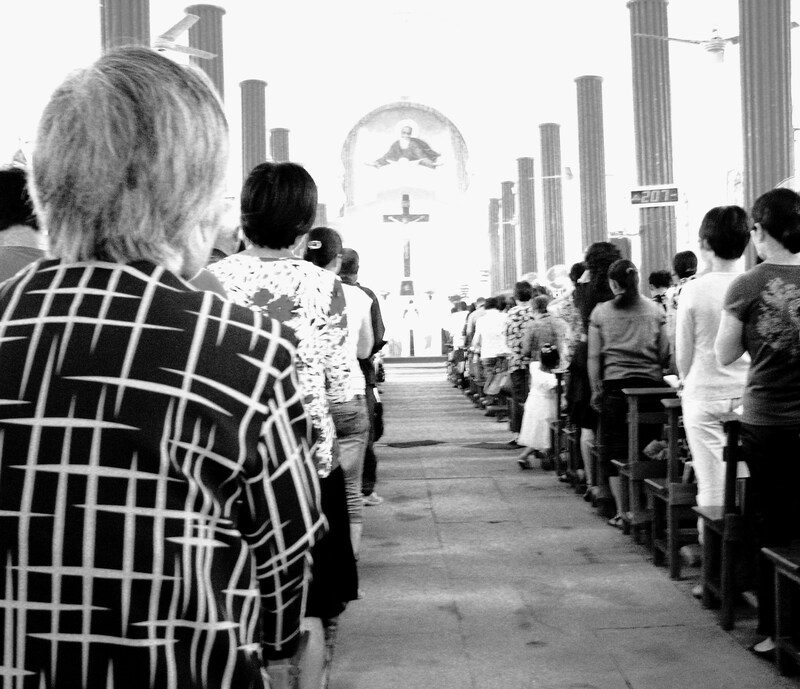 On December 12th 1982 Mass was once again celebrated at the re-opened church, while by 1986 all remaining families who had lived there during the Cultural Revolution had been relocated to new residences. 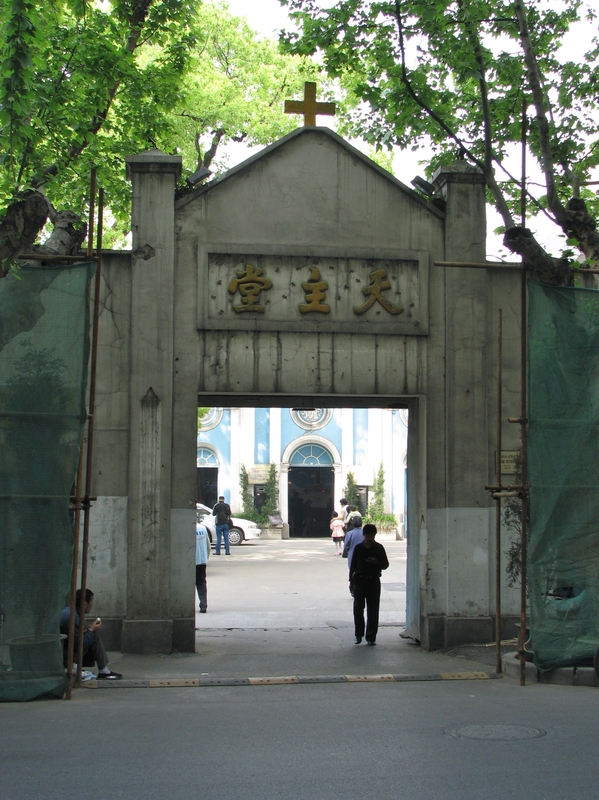 The Catholic Church of Our Lady Of The Immaculate Conception is now listed as an historic site under the protection of the Municipal Government of Hangzhou. 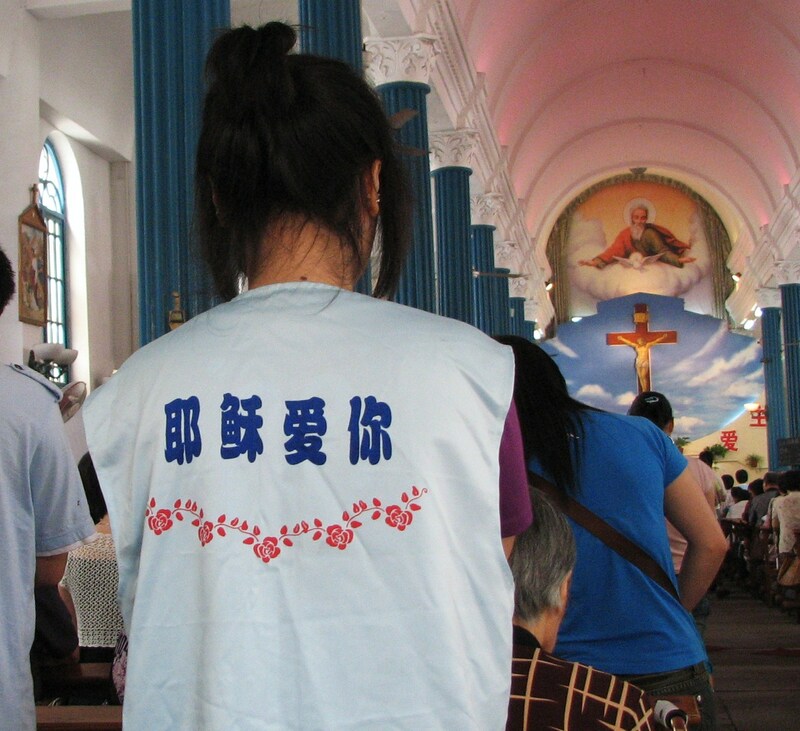 Prior to the founding of the People’s Republic of China in 1949 the Catholic Church in China was under the control of foreign missionaries, and some Church organisations opposed communist rule. In 1957 the secular Chinese Catholic Patriotic Association (CCPA) was set up to organise the Catholic Church in China under government patronage. It no longer recognised the authoritative role of the Pope as the leader of Chinese Catholics, and in the appointment of new bishops. The Vatican immediately declared the Chinese Catholic Patriotic Association incompatible with Catholic doctrine and since then there have been no formal diplomatic links between the Vatican and Beijing. An underground Catholic Church said to number millions of Chinese Catholics still remains faithful to the Bishop of Rome. 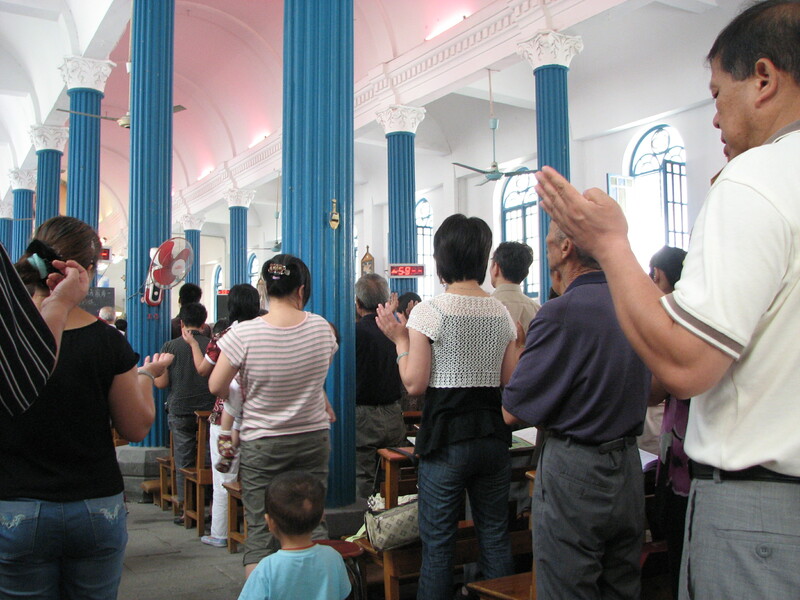 The Catholic Church of Our Lady Of The Immaculate Conception in Hangzhou is always filled to capacity for the 9.00 a.m.. Clear evidence of the growing appetite for spiritual values among mainland China’s officially atheist population, the worshipers represent a broad spectrum of men and women, young and old, all in thoughtful concentration. 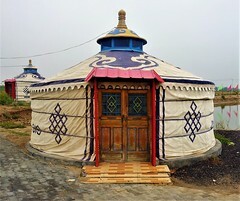 This church has a genuine feel to it and, given the unremitting pressures of daily life that abound in rapidly changing China, it is wonderful to observe and experience the congregation’s deep sense of spiritualism and respect for each other. Streaming out of the church after the conclusion of Mass all appear at peace within, assured. 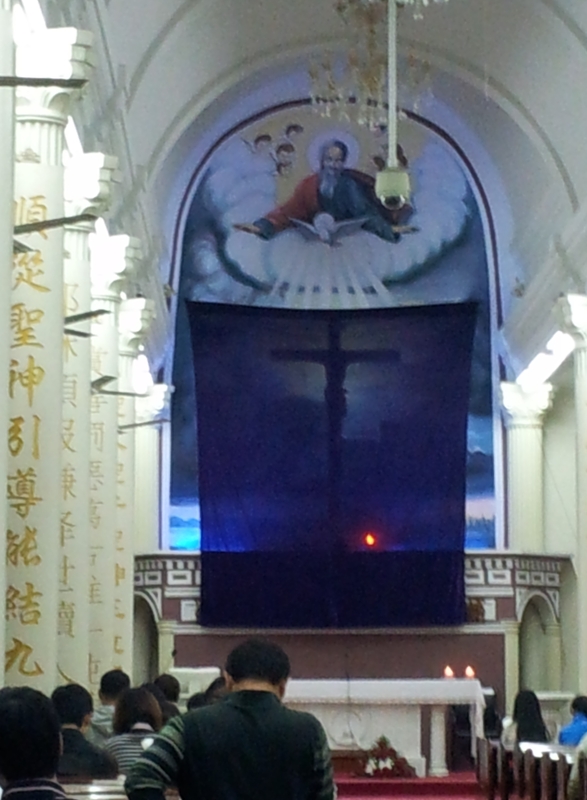 On the face of it, given that in spite of everything this is a Chinese Catholic Patriotic Association-operated church, this could be a Mass typical of any Catholic Church the world over. The choir sings the usual hymns (the acoustics are very good), while the benches at the foot of the left side-aisle hold a very energetic group of hearing impaired parishioners using sign language to communicate, their smiling facial expressions and fast-moving hands corresponding with every spoken word. There is holy water, a lively confessional, and communion, while the Our Father is prayed most fervently with hands raised high. When it comes to offering each other the sign of peace there is that spontaneous outpouring of goodness and togetherness which typifies Catholic Church communities everywhere. The genuine sincerity is palpable. If you did not have a chance to experience the serenity of a place like this you’d probably leave China thinking that in the rush to keep up with what is termed as “progress” everyone is only concerned with their own material well-being. 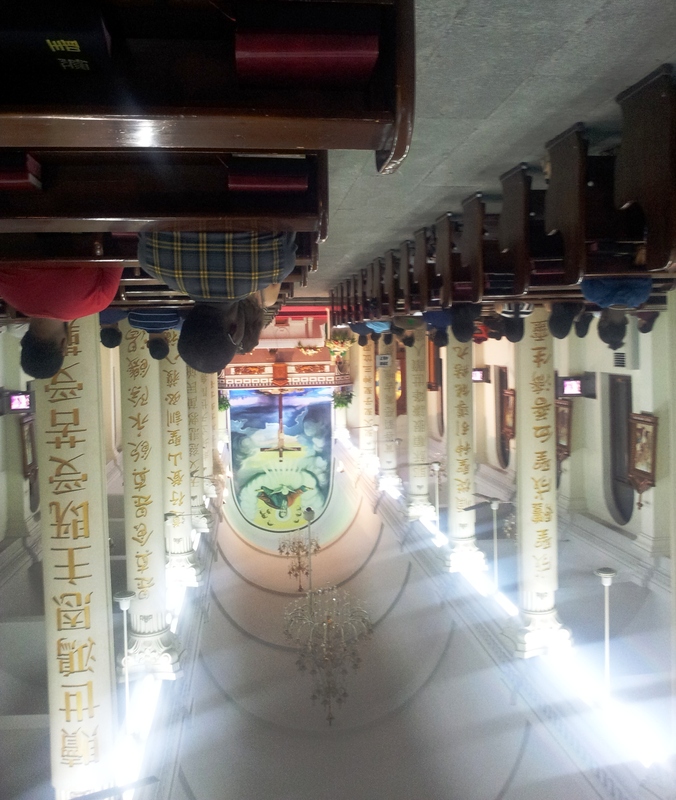 As witnessed by the outpouring of compassion following the apocalyptic Sichuan Earthquake, and now today in the Catholic Church of Our Lady Of The Immaculate Conception in Hangzhou such a thought would be entirely mistaken. 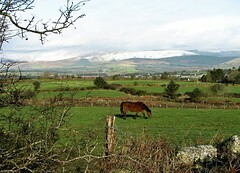 I cannot visually / vocally see or hear any difference between this and Mass back in Ireland, expect for noticing that no offering was collected. I guess the official Catholic Church in China doesn’t have a problem with funding! 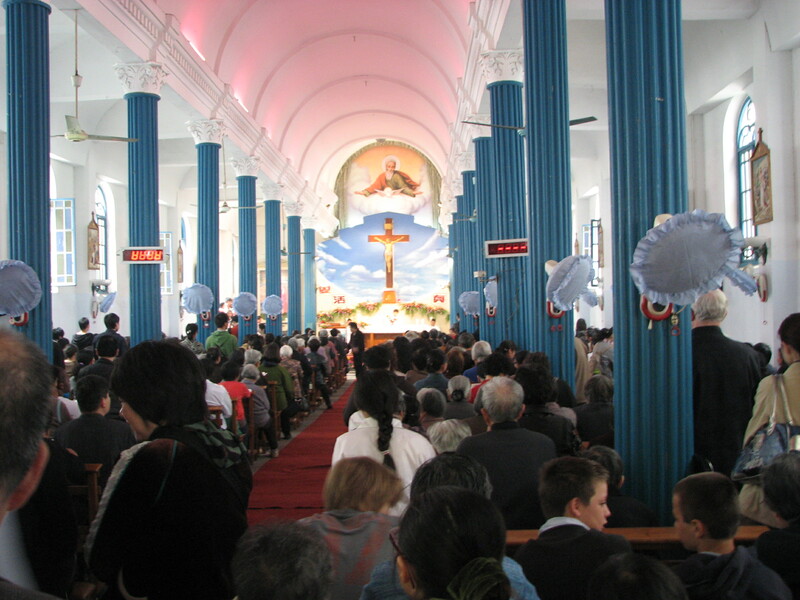 The most recent renovation of Catholic Church of Our Lady Of The Immaculate Conception in Hangzhou was completed in 2012, and while the demolition of the front wall may have been designed to present a church that is more conspicuously open, the appearance of security camera above the nave ensures that worshipers are always under the watchful eye of the Party. 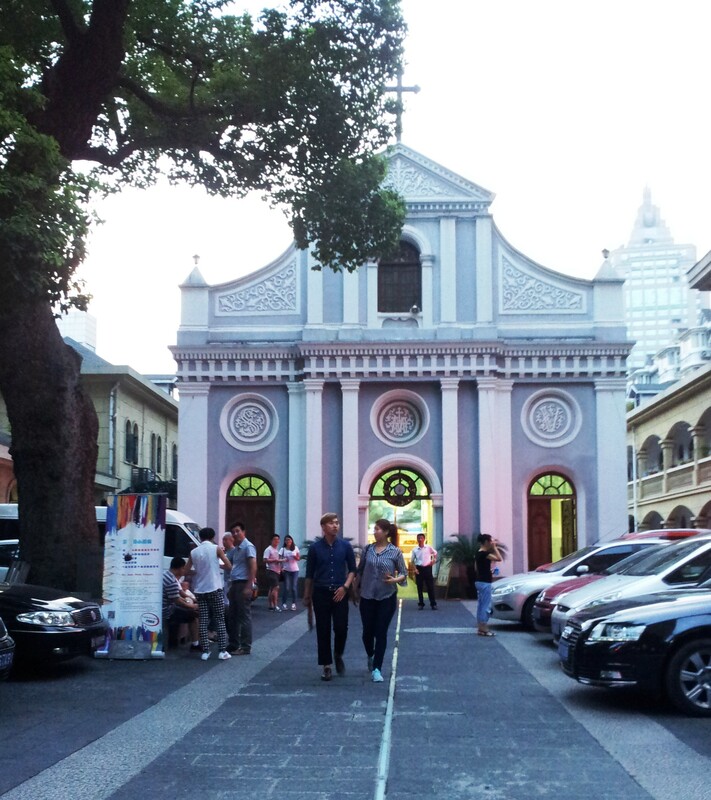 An English Mass, which is celebrated at 6.30 p.m. on Saturday evening, is typically attended by a colourful mix of Hangzhou’s foreign community from Africa, Asia, South America and Europe. The English mass pamphlet refers to the Pope (in a spiritual capacity) – indeed the wall of an office just inside the entrance gate hosts a large photo of the late Pope John Paul II. Previous Archbishops of Hangzhou, Matthias Wu Guo-huan (吳國煥) (1958–1987), John Zhu Feng-qing (朱峰青) (1988 – 1997) also had no papal mandate.